[Shanghai Bobby--the 2012 juvenile champion, whose victory in the Hopeful Stakes placed him atop these Saratoga Highlights in the last post--suffered his 1st loss in Saturday's Holy Bull. 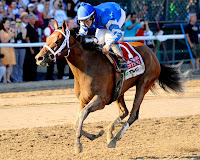 He was a very strong performing 2nd to Itsmyluckyday, who won in record breaking time for Florida's Gulfstream Park. Itsmyluckyday has not yet raced at Saratoga. He does, however, have close family ties. 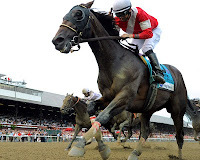 Lawyer Ron, his Dad (sire in horsetalk), scored huge victories at the 2007 Saratoga meet. In the Whitney, Ron set the track record time for all 1 and 1/8th mile races. 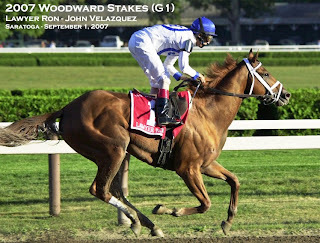 In the Woodward (which, as I've written before, is in my view Saratoga's very best race), Ron won--no, destroyed the rest of the field--by an expanding 8 length lead, in one of the most thrilling performances I've ever witnessed. Hopefully, we'll see Lawyer Ron's record-breaking son, Itsmyluckyday, at the Spa this coming summer. Then one month later, she faced an even tougher test in the Alabama. One of the country's premiere races--whether for fillies or colts--it hosted a particularly strong collection of the country's very best fillies last summer. (E.g., Grace Hall, In Lingerie, Zo Impressive). But in a "spectacular, exhilarating performance" (as announcer Tom Durkin called it), Q demolished the rest of the field by 9 lengths. The wire-to-wire romp was the fastest since the great Go For Wand won the 1 and 1/4 mile race in 1990. Q's dominating performances in the Coaching Club and the Alabama earned her the Eclipse Award for 3 year old fillies earlier this month. 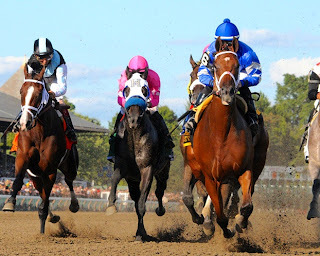 Perhaps the strongest field of older horses in any race at any track all last year--equaled, perhaps, only by the Breeders' Cup Classic in November--the Grade 1 Whitney Handicap is typically a highlight of the Saratoga meet. This year, it was very hard to beat. Ron the Greek, Flat Out, Hymn Book, Trickmeister, Rule, and Caixa Electronica were among the well known and well regarded competitors. But it was Fort Larned, winner of the Prairie Meadows Cornhusker Handicap (gr. III) a few weeks earlier, who came away with the trophy. Ahead in the stretch, the 4 year old colt, trained by Ian Wilkes and ridden by Saratoga debuting Brian Hernandez Jr., seemed to take a breather before holding off an advancing Ron the Greek. Fort Larned passed the finish line 1 1/4-length in the lead to win the 1 and 1/8th mile distance. And oh, that other great race for older horses mentioned above--the BC Classic in Santa Anita in November? 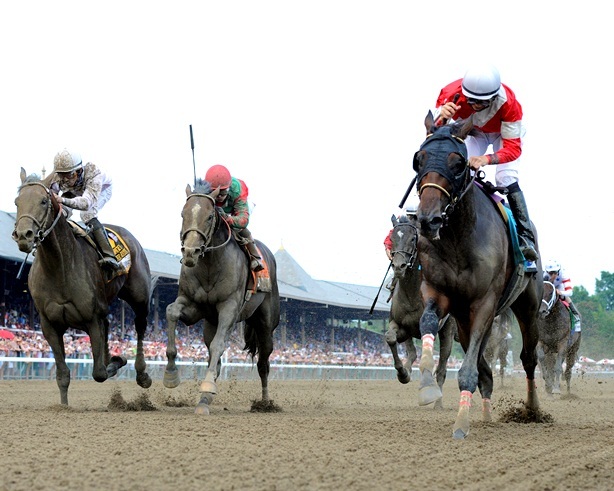 The Whitney presaged the result: Fort Larned's wire-to-wire victory in that 1 and 1/4 mile Grade 1 as well. At the Eclipse Awards, Fort Larned's performances in the Whitney and the Classic earned him the prize for older males. So many great moments, great memories, and too many highlights for a few short posts.